What's Behind Govt's Move to Privatize Public Enterprises? A regulation that will liberalise the aviation industry is in the making and has reached the Office of the Attorney General for legal review. Drafted by the Ethiopian Civil Aviation Authority, the draft regulation is expected to relax investment bottlenecks in the air transport sector, including lifting the 50-seat limit on private aircraft. If approved by the Council of Ministers, the bill will enable citizens to participate in domestic and international flight operations, maintenance and aircraft repair, consultancy service, aircraft design and manufacturing, education and training, import, distribution and leasing of aircraft parts. Non-national investors will also be allowed to engage in the aviation sector through full ownership, except in the case of domestic and international flights. In the latter case, they will be required to enter into partnerships with either Ethiopians or members of the Ethiopian diaspora with a maximum equity limit of 49pc. The minimum capital requirement for non-national investors will be 200,000 dollars and 150,000 dollars for joint venture with domestic investors. The Authority has three main directorates: Aviation Regulation, Air Navigation Service and Support Service. 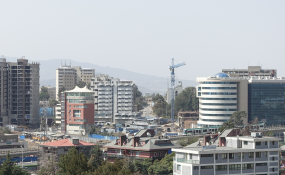 The new regulation provides broad opportunity for nationals and members of the Ethiopian diaspora to invest and play a significant role in the economy of the country, according to Endeshaw Yigezu, air transport director at the Authority, who has been with the agency for the last 15 years. "With more than seven decades of history of air service, we still have only one globally competent airlines and everything is controlled by the government," he told Fortune. "The government could not survive by intervening in capital intensive markets where every resource requires foreign currency." Ethiopia, which has been a member of the International Civil Aviation Organisation (ICAO) since 1952, has 16 private investors operating in the air transport sector. The companies engage in consultancy, aviation training, domestic flight operation, flight facilitation and cargo handling. Dawit Gebreigziabher, a well-known investor and aircraft business pioneer who is running National Airlines, said that the investment proclamation that limited investment in aircraft with less than 50 seats has been in contradiction to free market principles. "We have been able to discuss the issue with the Authority, and we are hopeful it would be one of the roadblocks that are addressed," he said. The major player in the industry is the state-owned Ethiopian Airlines that operates with a fleet of more than 100 aircraft, serves six million passengers a year and reported 2.6 billion dollars in revenue in 2017. Ahmed Kellow (PhD), the former CEO of Ethiopian Airlines and general manager of First Consult, agrees that it is a good idea to expand access to local and foreign investors. But most of the areas opened for investment require large-scale capital and state of the art technology that makes them more suitable for well-established and recognized airlines, according to Ahmed. "For local investors to venture to companies that offer consulting, education and training; as well as invest in domestic flights, presents good opportunities to enter the industry and grow," Ahmed told Fortune. The nation has an adequate skilled workforce to fill the demand in aviation management and maintenance, he added.